A week ago here in North Texas … schools were canceling their days, frozen mist was in the air, and cars were flying off the road by the time I headed back to Denton Monday night – mayhem. By Wednesday, the weather broke, headed east, and made history. What a difference! Today, on President’s Day, we’re looking at 75-degrees, and while the water is still hypothermic, unique fly fishing opportunities are there for the taking, and the driving. Typical chain pickerel caught on fly at Daingerfield State Park in East Texas. It’s a safe bet that after the weather breaks, the State parks will be crowded with people gone stir crazy. But when the weekend is what you’re dealt, then you load up at the crack of dawn, and take the chance to see how the chain pickerel are doing at Daingerfield. The weather and calendar had certainly aligned; warm air, cold water and clear skies make for some of the best days of fly fishing for the strange looking chain on the fringes of the small spring fed lake surrounded by beautiful pines. When the rain is in short supply, recovery from fires takes that much longer, and the damage looks as fresh as if it had happened six months ago. Chain pickerel look a lot like miniature muskie; duck billed fish with teeth that belong in a horror film, attached to a long camo green body that is very muskie-like. They seem to be just slightly more evolved than a gar, which makes them catchable on fly, and an exciting pursuit on Daingerfield. Don’t let me forget to mention how much they stink as well. The clear water of that lake often gives you the opportunity to see them come out and take your fly – especially if you are able to stand on your kayak. I didn’t see any reason to mess with success from the past, so I began by casting in the dappled shade edges of the lake, and within the first two casts of my whistler red-and-white, I had a small chain on the line. A few more casts yielded one more about the same size, but the wind was swirling, so I decided to leave fish to go find fish out of the wind. I knew the M&M’s were coming to fish, so I thought it best to push over to places that had never been productive to see if that has changed, or rule them out. The lake level is pretty constant, and after working some of those places that hadn’t produced – they still weren’t producing. And it seemed like there wasn’t going to be any escaping the wind in this bowl of a lake. The day progressed, warming up nicely, with a chain or two here and there. Once the Mendez clan arrived, I took a break before we set forth on our plastic armada to really hit the lake’s edges. Have a great week this week! It is so much less a big deal to arrive safely wherever you’re headed this week – than last. Tune back in tomorrow for the rest of the Daingerfield story, and a new technique that will certainly bring you more luck if you’re interested in the whole chain pickerel thing. If you have a story from a weekend of fly fishing, be sure to send it in to Texas Fly Caster. 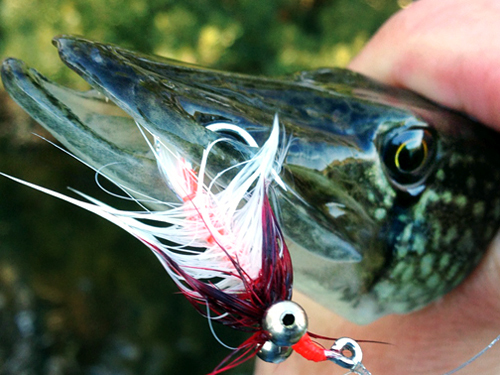 The best weekend story wins a $20-dollar gift certificate from the fly shop – Pops Fly Shop! Contact TFC for more details.